701 N. Main Street, Fuquay-Varina, NC 27526. Phone lines are open 9:am to 8:30pm 7 days a week.(919)552-7533. We are often here well before and after the above hours. Other hours by chance, appointment or please call if you want us to stay late for you. Closed Sunday, Monday & Tuesday, by chance and by appointment. Click here for the Google Map for our location & directions. on the corner of highways 401, 55 and 42. 14 miles from Raleigh and 38 miles from Fayetteville, North Carolina. Over 4,000 Sq. Ft. of gallery exhibit area. from some of the top artists painting today! 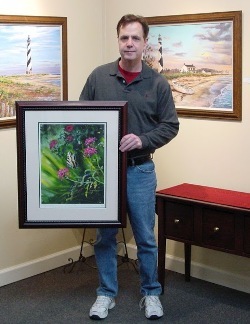 Rick Mullen - owner & gallery director. Because we try hard and are easy to get along with. Thanks for your interest in AshleyArt.Com, the online store for Ashley's Art Gallery.